What is an F Connector and why does everything use it? I hardly need to introduce you to the lowly F-connector. You probably have a few dozen cables, devices, and connectors in your home with this connector. It’s used for satellite, antenna, and cellular booster signals, and you’ll also find it occasionally used for FM radio, baseband video, and car radios. It’s a very versatile little connector. The F connector itself seems to date back to the early 1950s when engineers at Jerrold were doing experimentation on early forms of cable TV. They needed a cable and connector that were inexpensive enough to be used throughout the home, that was easy to connect and disconnect but stayed connected, and most importantly which worked well with the frequencies they were expecting to use. The F connector is extremely good at what it does. It allows for fairly thin cables to be used, and incorporates the white “dielectric” of the actual cable into the connector, which saves money and gives a better connection. Its twist-on nature means it stays secure and relatively waterproof but still shields the inner copper center from a lot of stray interference. Unlike some connectors out there, the F connector is well-suited for a very wide range of frequencies. It’s routinely used for everything from 50 to 3,000 MHz. Other connectors like RCA and SMA are used only for much narrower frequencies. Yes, it really does matter what connector you use, because using the wrong one can limit the strength or quality of the signal that travels through it. 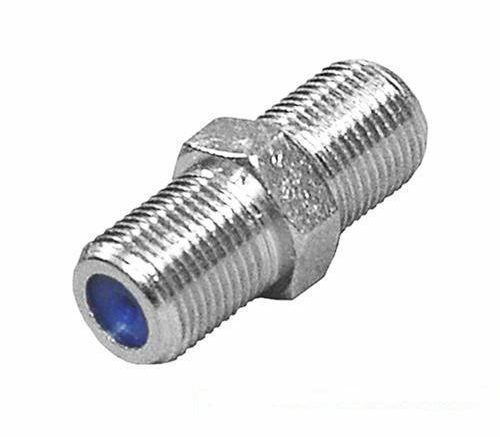 The F connector was originally used just for cable TV and antenna use, but it’s expanded into satellite, cellular booster and other uses as well. Industrial TV distribution still sometimes uses the BNC connector but F connectors are so common that you’ll see them used there. Other types of connectors, like the UHF connector once used for industrial video and the N connector (which is still used for industrial cell boosters) have been replaced in home use with F connectors because consumers like having one kind of cable and one kind of connector for all their devices. The F connector is used exclusively with 75-ohm cable. While it is possible to put an F connector on other types of cables, the results range from poor to utterly unusable. That’s fine, because 75-ohm RG6 cable is the most common, and the least expensive, pro-grade cable used today. The cable and the connector have become so successful because they are so versatile, and now that practically everything you care about has an F connector, that’s not likely to change.